Who knew you could roast a whole chicken in the slow cooker? Sure comes in handy on busy days! Did you know you can cook a gorgeous whole chicken (with vegetables) in a slow cooker? I have to be honest, this girl didn’t. 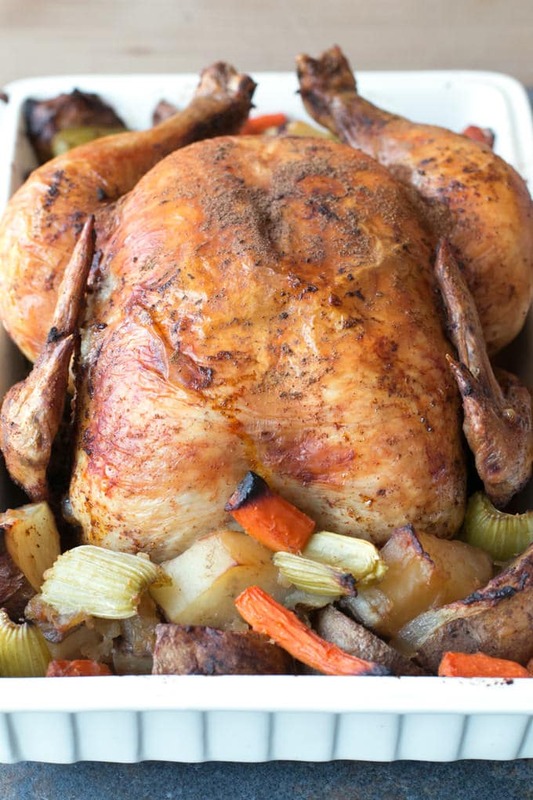 I thought whole roasted chickens were a labor of love, meant for Sunday afternoons when you have all the time in the world to cook a quality dinner for the family. The truth is, you can make this stunning, browned bird in your slow cooker (with a little help at the end from your broiler) while you’re at work. 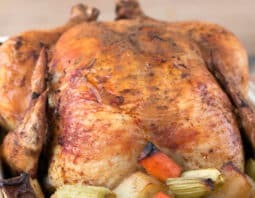 This bird can be cooking up in your slow cooker with vegetables so when you come home, all you have to do is throw the dish in the oven to crisp up the skin and set the table. Just check your casserole dish to make sure it’s broiler safe (here’s one that is). A key component of this chicken dish is the chili rub. The combination of dry spices seeps into the juicy meat of the chicken, making this anything but your ordinary roasted chicken. The other key component is stuffing the chicken with citrus and garlic cloves before you cook it. This helps infuse the chicken with bright and savory flavors to compliment the chili rub while keeping the meat oh-so tender from the inside out. 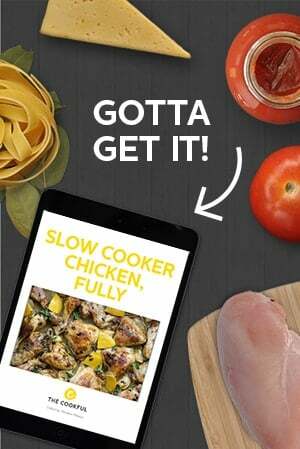 With less than 10 minutes of prep, you’ll be on your way to a homemade slow cooker roasted chicken dinner that everyone will love. The flavor of the dry rub, the citrus and the garlic all combine to make the chicken juicy, flavorful and rustic. However, the good flavor doesn’t end there. 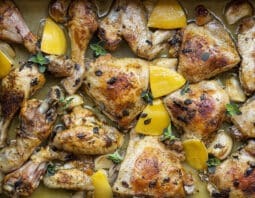 As the chicken cooks, the flavorful juices drip down, giving the vegetables an intense savory deliciousness that adds so much to the dish as a whole. You can even shred the leftovers for easy meals if you’ve run out of our super easy shredded chicken. Or, instead of washing the slow cooker and putting it away, you could prep some orange chicken or Coq au Vin for tomorrow night’s dinner. You’ll feel like you’ve already won the day when you pop it in and hit start in the morning. Everyone will think you spent hours on this whole roasted chicken, and you can secretly laugh to yourself about just how easy the recipe really is. It’ll be our little secret, ok? In the bottom of a slow cooker, place onions, potatoes, carrots and celery. In a small bowl, stir together salt, paprika, chili powder, onion powder, garlic powder, cayenne pepper and dried basil. Rinse the chicken with cold water and pat dry with paper towels. Rub the chicken all over with the spice mixture. Stuff the chicken with garlic cloves, lemon wedges and lime wedges. Tie together the chicken legs with twine. Place the chicken on top of the vegetables. Cover and cook on low for 4 to 6 hours, until it reaches an internal temperature of 160°F on an instant read thermometer. Carefully remove the chicken from the slow cooker to a cutting board. Strain the juices from the bottom and add the vegetables to a large casserole dish. Carefully place the whole chicken on top of the vegetables. Broil the chicken with the vegetables until the skin is brown and crispy, approximately 3-5 minutes. The internal temperature of the chicken should be 165°F. Remove from oven and rest for 5 to 10 minutes. Carve and Serve. (Here's how to carve a chicken, by the way).